Vessel Bavaria 37 Sport named Konstantinos has been built in 2008. We offer this boat from marina Lefkada in the region: Ionian Sea. Konstantinos is registered for 6 persons. Layout of the sailing boat is 6 (4+2). Bavaria 37 Sport Konstantinos is equipped with 2 bedrooms. For comfort of passengers there are 1 heads. You can fill the diesel tank with 760.00 l liters and in water tank it goes even 250.00 l liters. With motor 620 hp Konstantinos can move really fast. Konstantinos is 11.95 meters long and 4.03 meters wide. Draft is 1.00 m. Browse for different boats in this site: Motorboats Lefkada. Security caution is 3000.00 EUR. Choose our offer and enjoy your vacation on the deck of Konstantinos. 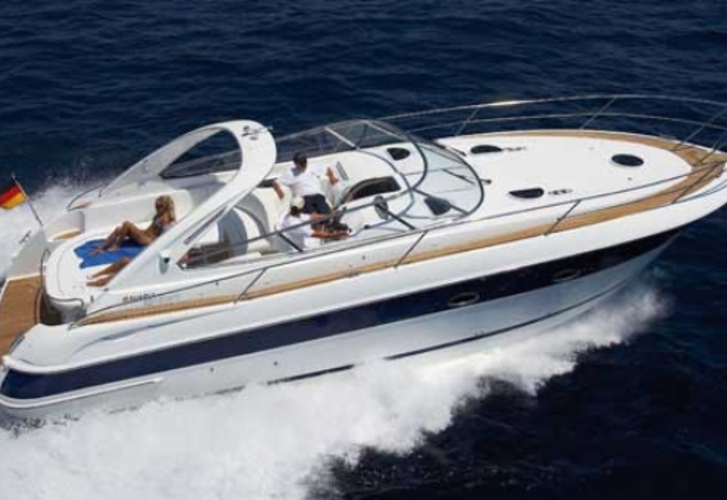 This Bavaria 37 Sport from Lefkada from Greece Look for by going to the section Motorboats Greece.